15 Now Columbus held its first action three months ago on March 15, organizing a small demonstration in the fast-food district bordering the campus of Ohio State University. Some who took part drove nearly 100 miles to do so, and most met each other for the first time that day. To publicize the event during the preceding weeks, a volunteer rode city buses handing out leaflets and gathering contact information from interested passengers. During the month of April, the Central Ohio Worker Center brought 15 Now volunteers and Socialist Alternative members together with numerous other organizations to plan the city’s most well-attended May Day event in many years. 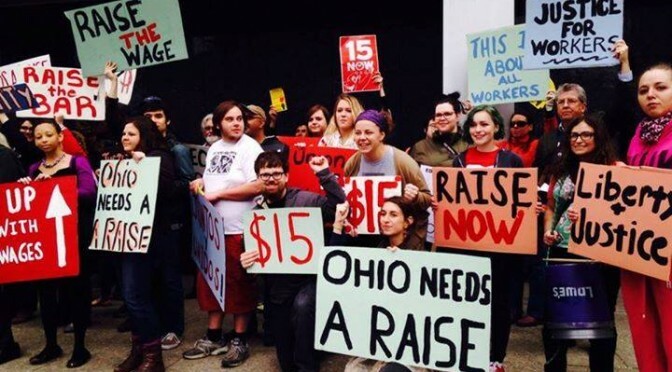 The theme was “Ohio Needs a Raise,” and large number of the 150 signs carried through the downtown streets on May 1 called for a $15 minimum wage. Following the rally and march, the celebration continued at the Ohio Education Association (OEA/CEA) union hall, with speakers, tabling, conversation, and food. Many who attended demanded continuing action in support of a living minimum wage. 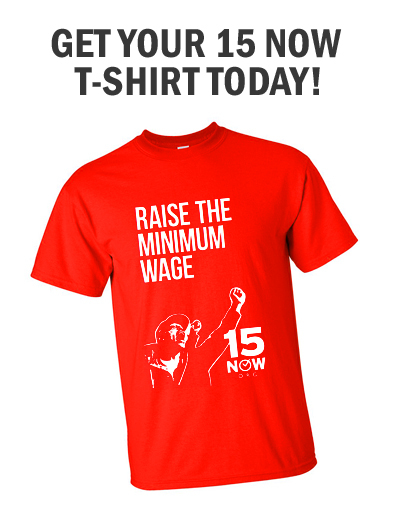 On May 15, 15 Now Columbus facilitated a meeting attended by 24 workers, activists, and union representatives interested in organizing support for raising the minimum wage to $15. Afterwards, several marched in solidarity with the international day of strikes. The summer will be spent publicizing the movement throughout the city and at ComFest, where 15 Now will table and make several presentations onstage to the large audiences in attendance. 15 Now Columbus meets each month on the 15th. If you live in the area and want to get involved you should join us!